When you allow your mind to speak about who you are, what do you hear? The voice of confusion or the voice of reassurance? Either way, be weary, our Ego never tells us the full truth about anything. When an attitude or opinion is expressed in our head, it is usually one that we could do without. Nothing speaks louder and could be more obnoxious than our mind thoughts. So don’t listen. It isn’t easy to shut out what goes on in our mind, the key is how to deal with it in a healthy way, and in a way that works for us individually. 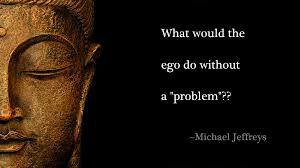 The Ego is responsible for our sense of personal identity, our sense of self-esteem or self-importance. Our Ego is addicted to negative thinking. When our minds speaks about who we are, it always comes up with something that is not real. Don’t allow yourself to take what you are thinking about yourself personally. The negative energy that is present in your consciousness keeps feeding on more negativity all of the time, if you stop nourishing it with your attention this energy cannot sustain itself. That is why it is so important to keep the recognition about yourself and your life inflamed with positive thoughts. This will increase the energy in your awareness to a more positive outlook. We are all this vast energy of awareness and our true nature is to resinate in love and joy. When your Ego gets involved in your day, shift your attention to the deep part of you that allows you to feel peace in yourself, this would be the place of your Soul. Our Soul dissolves all patterns of Ego, but you have to be ready for a fight, the Ego wants to survive and it will pull at those negative patterns. Be strong, deep breaths and simply stand up for yourself by keeping your thoughts on the up side.